Posted September 17th, 2018 by bemarketing & filed under Did You Know?. Fall is upon us once again! This means that your schedule might be getting a little crazy. From the kids’ school schedule and activities to your work schedule, it can be difficult to pay close attention to the features of your home. However, one aspect of your home that you should make sure is in good shape is your roof. Fall is the perfect time to have your roof inspected and maintenanced before those winter storms strike. At Rutter Roofing we are here to offer a few expert roofing tips for the season! When the leaves begin to fall around your home, you know it’s time to take a look at your gutters. Clean gutters are needed to keep the water flowing off your roof. If your gutters aren’t properly cleaned it can lead to cracking, mold and severe damage that might not be seen right away. Although cleaning gutters is a task that most homeowners can handle themselves, it can be beneficial to call in a professional to ensure that the job is done safely and properly! Trimming the trees around your yard will help prevent debris from falling and damaging your roof. As overgrown trees scrape the top of your roof on windy days, it will eventually begin to strip off layers of asphalt from your shingles. By trimming your tree limbs you are preventing them from damaging your roof, allowing your roof to maintain it’s visual appeal and effectiveness. Roofs are a huge investment, and annual roof inspections can actually save you money. Roof inspections are meant to help homeowners catch problems before they become major issues. Fall is the perfect time to get your roof inspected, while there is no snow or ice that could prevent any problems from being fixed. If your roof inspection indicates that you need repair work in a certain part of your roof, make sure you take care of the problem as soon as possible! You want to make sure that your roof is good-to-go ahead of the unpredictable winter weather. 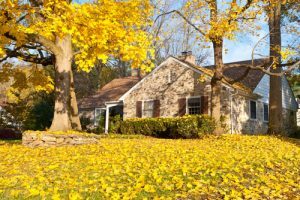 So make sure you make your home’s roof a top priority this Fall! At Rutter Roofing, we are your complete roofing company. As a CertainTeed 5-Star installer, we use only the highest quality products. We believe that providing well-rounded services is the most effective way to take care of our customers. If you are in need of roofing repairs or maintenance contact us here or give us a call at 610-584-2084!